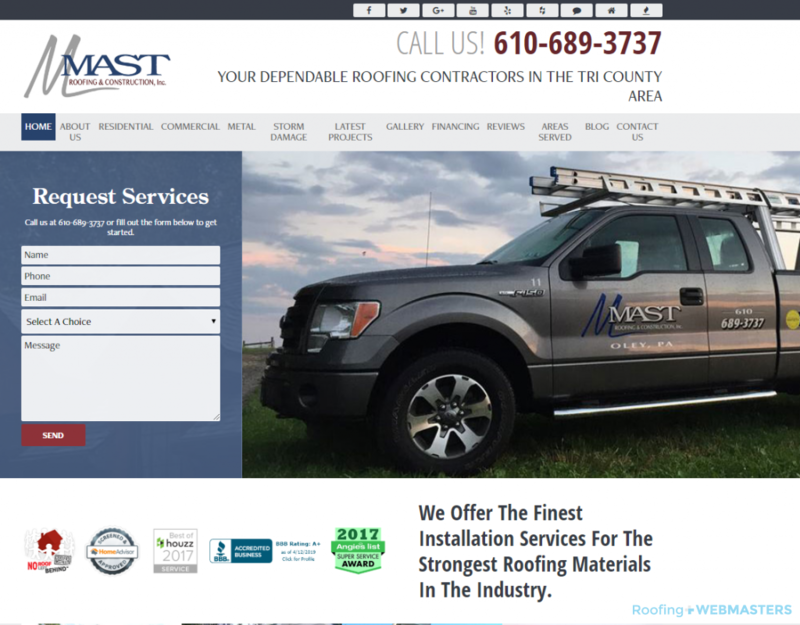 A website is an important part of marketing for roofing companies in 2019. Not only does it add credibility to your roofing business but it can increase the number of customers you reach. But to stand out from the 1.6 trillion websites across the web your website must possess certain qualities known to drive success. Additionally it should avoid the pitfalls associated with poor performing websites so that you can maximize your marketing investment and turn a profit. Why Is a Website So Important for Your Roofing Business? There’s more than one reason why a website is critical to your roofing business. We mentioned credibility and reach but perhaps the most important function of roofing company websites is to produce high quality leads for your business. Competition is also a factor. 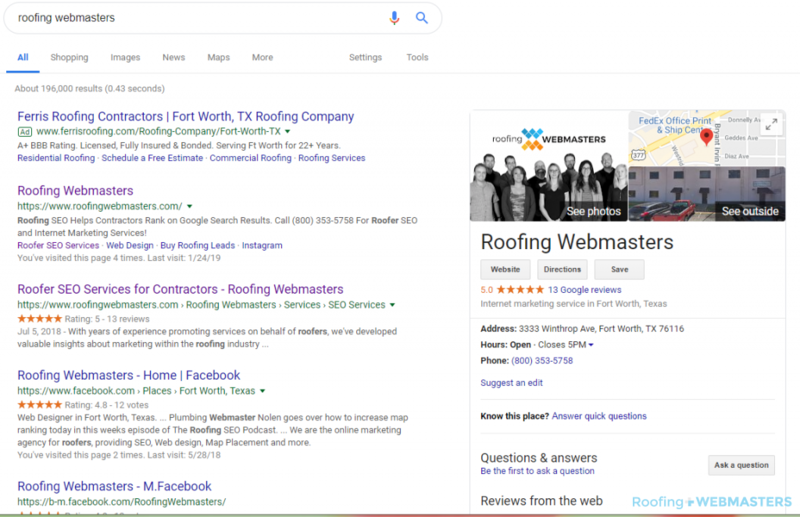 The top roofers in your local market almost certainly have an online presence and to compete with them on Google search engine, a website is necessary. The best looking roofing websites share similar design traits. And so do the ones that perform the best. It starts behind the scenes with clean codebase and extensive schema markup and ends on the front-end with a user-friendly and personalized website experience, including convenient calls to action (i.e. a clickable phone #). Typically, the most successful websites incorporate custom design meaning they don’t utilize roofing website templates of any kind. Users see the front-end of a website which impacts how likely they are to convert into a lead but what happens behind the scenes can be equally as important for SEO. Clean codebase helps a site rank higher because of increased site speed and superior crawlability. While you’ll still need an appealing front-end to convert customers, clean codebase can help you get them there. As we noted, roofing contractor websites that use templates are typically less successful than those that use custom design. SEO is the main reason why this is the case. Custom websites usually have cleaner codebase and superior schema markup which allows them to more effectively communicate with Google search crawlers and therefore rank for more keywords. Mobile internet usage accounts for 65% of U.S. digital minutes which means that roofing contractors without mobile websites are losing out. Designing a mobile-friendly website should be the top priority for contractors in 2019. Mobile users have a particular appreciation for simple navigation and clear and discernible calls to action (typically a clickable phone number). It’s irrational to expect consumers to trust any website they come across. To facilitate a better first impression on website visitors it is important to use personalized graphics including photos and logos as well as badges of honor (i.e. local roofing awards). When your website displays a unique feel that seems trustworthy, conversion rates are expected to increase exponentially. While mobile users are more active than their desktop counterparts, it’s not as if desktop internet usage has disappeared entirely. Websites for roofers should still display properly on all devices. This can be achieved with responsive design which prompts your website to adjust to the device on which it is currently being accessed. This solves all kinds of problems with mobile & desktop. Although SEO expands beyond the design process itself, there are designers who can create a website with SEO in mind. These designers understand that clean codebase and schema markup sets the foundation for search engine optimization. Without the presence of these two components, it will be difficult to rank for the top roofing keywords in your respective local markets. 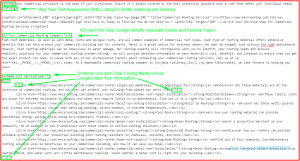 Google parcels website data through a microdata tag language known as schema markup. The more markup within your roofing contractor website, the easier it is for Google to understand the purpose of the website and its content. Marking up contact information, for example, makes it simple for Google to identify who you are, where you are located, and how customers can reach you. What Do Roofing Websites Cost? The cost of a roofing website depends on the type of site you invest in. For example, a template website design can cost as little as $300 as a one time fee but includes none of the services required to market your roofing contractor business online. Investing in web design from a marketing agency is typically bundled into a monthly fee of between $1,000 – $3,500 but comes with SEO, content writing, domain name registration, and ongoing web work. 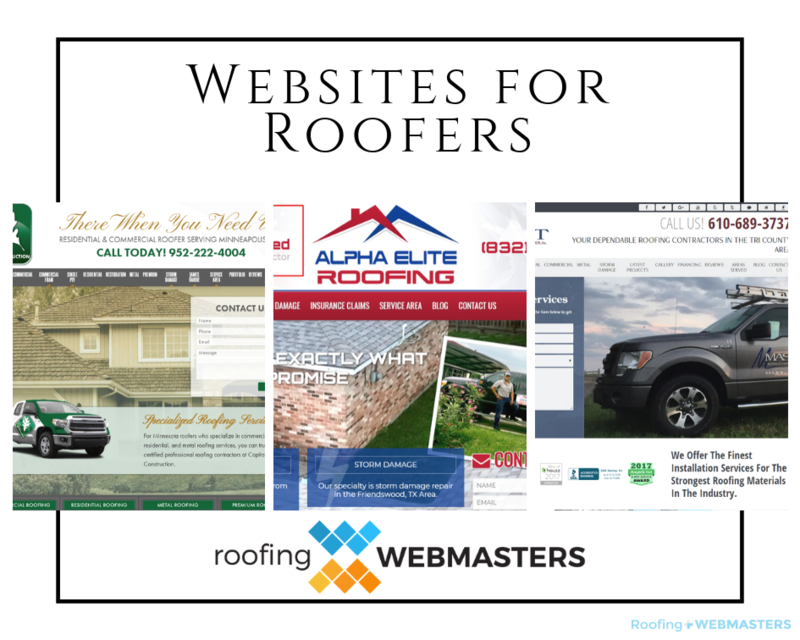 You can check out a portfolio of the best roofing websites from Roofing Webmasters. Furthermore, you can perform a local search for roofers in any city and go through the first page of search results. The websites ranking on page one are doing something right and you can learn from both their strengths and weaknesses. Relative competition will always be a factor in search results so smaller cities and towns may have a lower standard. Roofing website content is critical to online success. Websites without quality content won’t rank on search results and visitors who enter the site will not find the information they seek. Content typically comes in the form of pages and posts especially if using WordPress as your content management system. Having each service as a page along with monthly blog posts is a good formula. Unique and original photos help build trust with consumers. An image of you and your roofing contractors next to your company truck is going to give you immediate credibility. In contrast, a stock photo of an old town roof is going to prompt indifference from that same consumer. Images should be web-ready and mobile-optimized to preserve speed and performance and facilitate Google rankings. Websites should incorporate the best keywords for roofing companies which are identified through keyword research tools like MOZ & SEMRush. Using these terms within the site’s title tags, header tags, meta descriptions, image alt texts, permalinks, and content can improve its ability to rank on Google for those very terms. One thing to avoid however is a tactic known as keyword stuffing. It involves excessive flooding of a single term throughout a webpage. We touched on the design aspect of SEO but optimization continues after the design is complete. For example, the creation of new pages and posts will also create URL permalinks. These should be optimized for search by being shortened and renamed for relevance. Content, keywords, and images can all be optimized and should be for roofers. Optimization is an ongoing process that constantly adjusts to Google’s latest algorithm changes. WordPress is not a template but rather a content management system (CMS). With that being said, templates can be designed specifically for the WordPress CMS. So when roofers hear about things like roofing wordpress templates it can be confusing. Will Roofing Ads Help My Website? Roofers can pay for clicks to their website with PPC advertising campaigns. This can be a useful way to generate visitors quickly but it should be used with discretion and preferably under the guidance of a certified Google Ads campaign manager. Do Websites Generate Roofing Leads? Yes. When properly designed and optimized, websites should generate high quality roofing leads. While avenues exist to buy leads on their own, producing them through your website is a far more affordable and sustainable form of lead generation. Can You Design My Website? Yes. 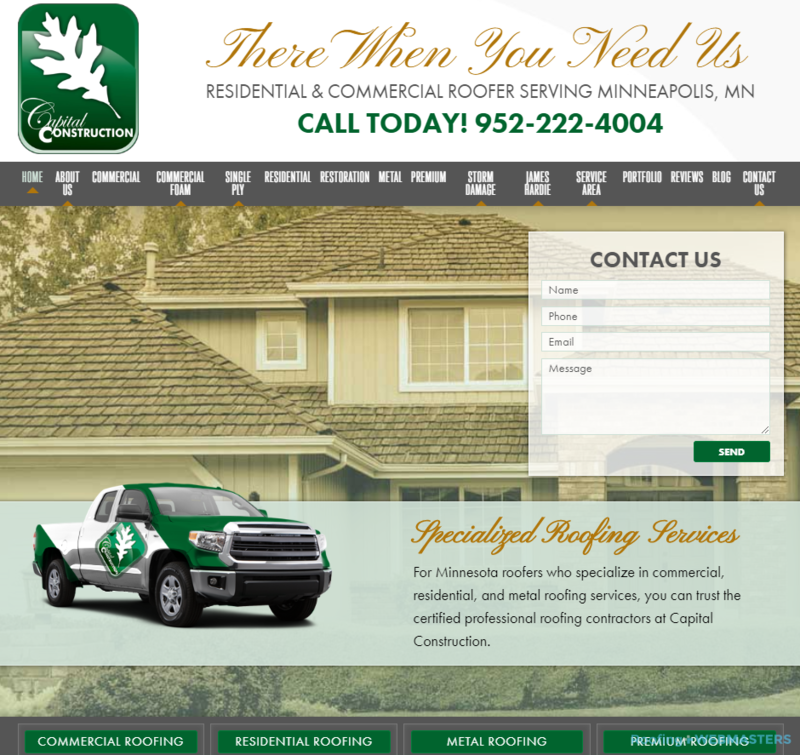 Roofing Webmasters offers website design for roofing companies across the United States. Our services include SEO, content writing, local mapping, reviews management, and more. We are happy to discuss your unique circumstances during a free phone consultation. Having passed the infamous 20th of March, spring season is here and it is a prime time for roofing companies to capture business leads. Punxsutawney Phil may not have been spot on with his early spring prediction but the weather is starting to progress closer to warmth across the nation. With cold spells still interjecting themselves this combination of hot and cold has a chance to create severe hail storms, something we’ll touch on more later. But spring in general is always going to present a major opportunity to roofing contractors. But how does one take advantage of the most opportune season to generate roofing leads and grow your business? The truth is that winning the race for spring roofing leads should start prior to spring season. The companies that have already created a custom website, optimized it for search, and placed themselves on Google My Business are going to have a major head start on those late to the party. Google and Facebook reviews of these businesses is also a major factor that can determine who scoops up the majority of the leads this spring. The gap may already be large. Not everyone had the foresight to optimize their website prior to spring, especially those that are new to the roofing industry or to a specific location. Having an aged domain name is always going to be ideal for SEO purposes and optimization takes time in general. Most new roofing campaigns are looking at a 6 month minimum for organic ranking. One way to close the gap in the meantime is to invest in PPC management through Google Ads. Buying clicks can get leads quickly. If PPC is out of your price range, the time to start gearing up for next spring (2020) is right now. While the idea of waiting this long may seem discouraging it will payoff next year. Remember, while you might lose the SEO race this year, you can get a head start on the race next year. The reality is that the roofing business is more like an online marathon. If you consistently improve you will end up winning in the end. Even if PPC is an option, you should still invest in SEO for next year right now. There are some roofers in the industry known as storm chasers. But the truth of the matter is that companies who are already optimized for hail storm roof damage in their service area are going to have a leg up on fly by nighters. The top roofing websites have an individual webpage for storm roof damage in addition to their homepage and pages for other services. Over time, this page optimizes for the target keywords that heal inflicted homeowners search on Google. To generate local leads your business must have a presence on Google My Business along with supporting reviews and a verified address. 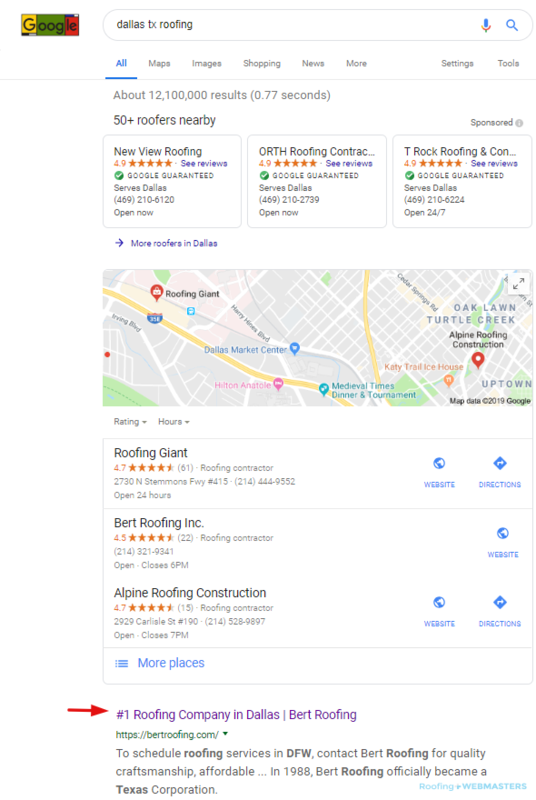 The goal for roofers is to show up on the Local Map Pack which is a group of Maps listings selected by Google based on relevance, radius, and reviews. Roofers should try to generate as many reviews as possible and do so consistently. Google not only checks quantity but also recency. Google Ads can also appear on the Map Pack if properly connected to your GMB account. Tired of losing out on spring roofing leads every year? Roofing Webmasters full digital marketing package can solve your problems once and for all. As a digital marketing agency that provides custom website design, content marketing, Google Maps optimization, PPC, and SEO, there’s no aspect of the race that we can’t help your business with. The best leads come from an investment in your own brand which is something we empower our roofing clients to do. We build everything from the ground up with custom codebase, schema markup, and logo design. Back in the day roofers did advertising for TV, Radio, Print, and Billboards. That’s where all the eyes and ears were. Today in 2019, all of those eyes and ears are on social media. One social platform in particular is known to generate plenty of eyeballs. Facebook users visit the network 14 times per day on average. This presents a great opportunity for roofing contractors. 80% of all online advertising goes to one of two platforms. The first is Google Ads (AdWords) which is very well known in the home service industries as a way to generate clicks fast. The second is Facebook, which is what we are here to discuss today. Facebook provides unique opportunity to roofing companies. Not only can roofers advertise to a large pool of people but they can narrow that pool into a more specific and highly convertible group. With demographic targeting, contractors can advertise to individuals based on age, interests, location and much more. The platform will even draw correlations between your company and other things a user “likes” so that you can showcase your services to someone who is highly probably to need them. Roofers can choose the amount of dollars they want to spend each day or for the duration of their campaign. This number is known as Ad Spend. You also have the option to place a bid which will be the maximum amount you’re willing to spend when someone views your advertisement or completes its call to action. Based on Cost Per Click (CPC) Facebook ads cost about $0.27 per click. The bottom line is this, Facebook advertising cost varies heavily based on your company’s current financial resources and how much of them you’re willing to advocate to marketing. Setting a budget will fit in line with your other business goals in 2019 and beyond. Back in the day radio ads were a rudimentary outlet for demographic targeting. Roofers would pick a certain show at a certain time that had recorded the general demographics of its listeners. For example, the rush hour show might have 75% homeowners between ages of 35-65 which would make a pretty good target for a roofing company. While this seems innovative at the time that data is now unreliable in comparison to the detailed analysis provided by Facebook. Aside from the information that users voluntarily give to Facebook, the platform also tracks their every move and draws topical correlations between their activity and their probable interests in you. Like with other forms of advertising, namely PPC on Google Ads, Facebook advertising is dependent on its strategy. Targeting the wrong types of users will empty your budget quickly and ultimately produce a negative ROI. Facebook knows this and will lobby advertisers to spend more and more on their campaigns to extend the audience reach. But reaching everyone is not cost-efficient. To master ads on Facebook, roofers must define a goal prior to launch. For those without experience using the platform, investing in an experienced Facebook Ad campaign manager can prove worthwhile. Other factors that go into the success of an ad campaign include copy, landing page optimization, and ad extensions. Roofing Webmasters’ owner Nolen Walker trained as a Conklin Dealer to better understand the industry he serves. As a full digital marketing agency for roofers, Nolen took it upon himself to learn the intricacies of commercial roofing. With over 100 roofing clients already on board, our agency is considered the top authority in roofing SEO throughout the nation. We work with both residential and commercial contractors, but in today’s podcast episode we are going to discuss marketing for Conklin Dealers which applies to commercial roofers in particular. We have created successful websites for Conklin Dealers, including those that optimize State-wide and for a variety of high-ROI keyword terms. As you know, certain commercial jobs can be a jackpot. How Many Companies Do Great SEO Work? Before diving into the specifics of marketing for a Conklin Dealer, we should ask commercial roofers across the nation, how many web companies do you believe can do SEO work? There’s about 100,000 SEO companies across the country. We know of 3 total who can even do the work it takes to optimize a commercial roofing website. That is 3 out of 100,000, equaling a percentage of less than 1. Now there are plenty who can throw up a website as a glorified hosting fee, but without it optimizing, that website becomes mostly a placeholder that fails to return on investment. How Many Focus on Specifics? Even the SEO marketers who are able to do the work and optimize your commercial roofing website don’t have the focus of understanding that Roofing Webmasters does regarding specific commercial roofing terminology like acrylic coatings and PUMA XL? What about the bidding process that returns massive ROI for contractors? At Roofing Webmasters, we understand all of this and to a greater degree than literally any other digital marketing firm on the planet. If you are a Conklin Dealer looking to generate leads State-wide, there’s no greater partnership than the one offered through Roofing Webmasters. You might only get 20 calls per year for a specific niche keyword like cool roofing but those 20 calls can return an incredible ROI. This is especially true when your site is optimizing State-wide. We target hundreds of keywords which will combine to rank your website for terms that no other websites target collectively. Because commercial jobs are so valuable, the search volume of a given keyword isn’t as important as it would be in perhaps a residential marketing campaign. Our methodology is to target every commercial niche to get your company more jobs. Conklin has been a champion for commercial roofing products for the better part of 40 full years. Conklin roofing systems are done superior to most. When properly installed they protect commercial buildings against UV rays, energy use, and degradation. Conklin Dealers tend to perform better online once optimized. In other words, if you can get people to your website, converting them becomes easier than it otherwise would be. TPO roofs are generally failing all over the nation because there are seams all over it. Coatings from Conklin really provide value to the customer and therefore are a great marketing engine to drive your commercial company. Visit Conklin’s Official Website to learn more about how to become a distributor. Google’s latest algorithm changes place an even greater focus on user intent. While intent has always been a consideration, it was not until recently that Google began to master the specifics of search queries in relation to a user’s intended meaning. The result has shown major variance in search results based on only slight alterations within search queries. For example, a roofer searching for roofing website design will find far different results than they would when searching roofing web design templates. The extra word “templates” changes the intent entirely. The user is demonstrating a need for template examples rather than a more general overview of website design. In today’s episode you’ll learn how this translates to roofing services. Google’s algorithm is getting smarter and that’s good news for search users. However, it can be somewhat alarming to roofing contractors who are used to ranking for keywords based on general content. It used to be that a search query like “roofing shingles” would yield results that had loose association to the term. Today, Google has moved closer to identifying the most appropriate page to display for that query. What does this mean for roofing websites? It means that specifics matter more thane ever before. This includes both the implementation of hyper-specific webpages as well as refinement of content within an existing page. Roofers who master this balance will have the most success in 2019 and beyond. When prospective customers search for roofing services, what they don’t intent to do is consume horribly written content with stuffed-keywords. There’s no value to them in reading a bunch of keywords listed over and over again. Instead, they want a more robust overview of a subject. One way to ensure this exists is through latent semantic indexing keywords, better known as LSI. You can use LSIGraph.com to find semantically related terms to your primary keyword. You;ll want to use these synonyms throughout your webpage so that the writing provides full coverage of the subject and looks more natural to read. LSI keywords can also have ancillary benefits as well, including decreased bounce rates and higher internal link click rates. A successful roofing company starts with proper marketing. So when contractors looking to start their own roofing business ask how exactly to get started, the answer is simple. But to market properly, roofers need a passion and dedication to promotion. If your first instinct is to devalue the importance of marketing, you will never succeed in launching your business off the ground. Conversely, if you eat, sleep, and breath marketing… constantly finding ways to promote your business should be second nature to you. If this describes your mindset, you are ready to learn how to start a roofing company. Roofing Webmasters can help by managing your digital web presence. If you’re going to succeed in this business, you need to let go of any preconceived notions you have about marketing and its worth. If you believe marketing is overrated or unimportant the best thing you can do right now is give up. If you have an open mind however, and are willing to put consistent energy and effort into promotion, success is not only possible, but it is likely. This kind of can-do attitude is what is the separator between new roofing companies that succeed and those that fail miserably. Starting a business is not easy, but it always requires marketing. Without a lead, there’s no money. This must be the most basic understanding of a prospective roofing company owner. There’s lots of bells and whistles that contractors think about when designing their company plan, but it’s paramount to understand that they are not fundamental to launching your business. Forget about your dream truck for the time being, your only goal should be to generate as many leads as possible by utilizing every marketing tool at your disposal. Just remember, no leads = no clients, no customers, and ultimately; no service. With limited funds, contractors can still start a roofing company. But since they can’t invest much in digital marketing upfront, they are going to need to use a more traditional method. This method is door knocking. Roofing is one of the few industries where door knocking still works in 2019. Does that mean it is an ideal way to get clients? Absolutely not. Door knocking should be looked at as a temporary way to get leads which can then be leveraged into more sustainable methodologies, including digital marketing services like search engine optimization, PPC advertising, and Facebook advertising. You can’t be afraid to start at the bottom when starting out. Once you’ve done a few jobs, it becomes time to invest in a custom roofing website. This should be done with due diligence as far too many roofing company websites lack customization and fail to rank for any worthwhile terms. Many free website makers are available on the web, but none of them provide the control afforded by true custom design. Template makers like WIX can help you create a website that looks visually passable but it is unlikely to project the kind of professional appeal that converts users into customers. With a marketing-first mindset, the easy choice will become the one that is going to create the most leads for you and your business. Not all leads possess equal value. If you’ve ever used a lead sharing system you’ve probably learned this the hard way. Companies just starting out often go the route of cheapness and invest in shared leads which end up costing them their business and sometimes their entire livelihood. Shared leads, from a metaphorical perspective, are like dropping raw meat into a shark tank. Your brand new company will be fighting with more well established brands for the same lead. Unsurprisingly, the rate of conversion is depressingly low. But high quality leads still exist online, they just come through organic SEO and website design. Exclusive leads from your own branded entities are invaluable and can propel your startup roofing business to success. Some of the material goals of roofers are truck wraps, offices, and properties, but none of these things can manifest without leads. The cycle goes like this; leads, clients, resources, materials. We spoke about why leads are harder to come by than you might think and why only certain types of leads are actually worth their weight in water. The business cycle is totally dependent on their existence however, and so leads must remain the top focus for startup roofers in 2019. Investing all energy into marketing will help facilitate an environment where this cycle flows cohesively and yields the kind of return that can supplement a business model moving forward. Starting a roofing company is not something you can do alone. Since marketing will be the foundation for your success, a little help from your friends at Roofing Webmasters can be the difference. We create custom websites on behalf of roofers, optimize those sites for search, and help generate exclusive leads through a variety of web entities, including Google Maps. We aim for our clients to dominate local search rankings and start a streamline of valuable leads that can serve as the structural integrity of the business itself. We work with clients that have started the process by generating jobs through door knocking. Our services require a monthly fee. Our services expand far beyond the main categories listed above. Worried about a logo for your new roofing company? We provide 3 mockups of logo enhancements so that you can have an evolved version of your current logo. Not only that, but we integrate its color scheme into your website for a seamless and aesthetically pleasing presentation of your business to the consumers in which it targets. Like we noted, leads come from a variety of sources when a web presence is truly optimized. Locals might find you through the Local 3 Pack (Google Maps) or they might find you on an organic search result using their mobile device, such as a smartphone. Consumers are heavily influenced by 5 star review ratings that appear beneath your roofing company on search results. This star rating is an aggregate rating of all reviews of your company and there are ways to improve the amount of positive testimonials without compromising your company’s integrity. Learn more in today’s podcast episode. The roofing industry is a cutthroat field, and as such, your roofing advertising efforts must be impeccable to outshine your competitors to get the roofing leads that you need. But with all the marketing and advertising solutions available, how do you market a roofing company productively? In today’s world, digital marketing outranks all other advertising channels in ROI and reach. However, this doesn’t mean that all of your roofing advertising dollars should be spent in the digital world. Professional marketers know that a great campaign consists of multiple advertising channels and messages. Knowing your options is the first step to comprehensive roofing advertising campaign development. Roofing Advertising Can be Presented Effectively Over Multiple Channels. Within the marketing landscape, your company has multiple channels to spread its message. From television and radio to billboards and digital media, your advertising options are almost endless. Each platform offers benefits that can increase your business reach and build your customer base. In order to decide on the right roofing advertising platform for your efforts, first, decide on the details of your campaign. Your Budget is One of the Most Important Factors When Planning Your Roofing Advertising. Goal: Identify the exact goal of your campaign. Do you want to increase roof leak service calls? Would you like to increase traffic to your website? Budget: How much will your ad spend be? What ROI are you expecting from your roofing advertising? Run Time: How long will your campaign last? Will your campaign be weeks long? Months? Each of these factors greatly affects the type and style of your marketing efforts. For instance, if you are creating a six-month advertising campaign, a start to finish television commercial could be extremely costly while a six-month Google search ad may be only a fraction of the cost. Typically, marketers use a combination of platforms throughout the campaign period to promote the most results possible. Once you have decided on the basic campaign factors, you can start planning your ad. These factors should be based on the audience you want to reach and the goal you want your audience to accomplish. For Your Roofing Advertising to be Effective, it Must be Properly Planned. Platform: What marketing platform will you use to spread your message? Which platforms have worked best for you and your competition’s past efforts? Message: What message are you communicating? What call to action will you use? Measurement: How will you measure your campaign’s success? How will you track ROI? When it comes to advertising, you have a long list of options on where to spend your marketing dollars. From print to digital, you can find advertising opportunities just about anywhere. While many platforms offer low but stable ROI, others offer increased but fluctuating ROI. Utilizing a combination of platforms can help expand your reach and boost your roofing marketing ROI. Effective Roofing Advertising Can be Achieved Through Multiple Marketing Channels. Within the realm of print advertising, there is a multitude of options. Your roofing company has the choice of newspaper ads, billboards, mailers, and more that can each boost company awareness. Print ads are ideal for getting your brand name recognized within a particular area. These platforms work well for advertising roofing services, promotions, and even location. However, they do not create a great opportunity for prompting immediate action. Oftentimes, print advertising is costly and difficult to accurately measure. However, new advances such as QR codes and promotion codes offer better print advertising tracking than ever before. Consider these points before deciding which print platform is best for your roofing company. Newspaper: While newspaper advertising has been a go-to marketing hub for years, the presentation of online news media has seriously dented readership. Use this platform for older age groups that are less likely to refer to digital media for news. Billboard: While this style of advertising gets great viewability, the response is much lower than other marketing avenues. Use billboards as a supplement to boost your brand awareness. Direct Mail: These advertising options are tried and true methods of building brand and promotional awareness. Use roofing mailers for promotional offers and service updates for your roofing company. Using traditional television and radio to deliver your advertising message can get expensive quickly and offers few analytics tools to track effectiveness. However, clear, precise messages are easily delivered on these platforms and have a higher retention rate than most print options. Television and radio advertising is best used in short spurts for the advertisement of a promotional offer or time-sensitive information. Radio and TV Present Great Opportunities for More Detailed Messages. Television: Television commercials are an ideal way to present company services and promotional offers to a large general audience. Timely information like storm details and specials are well-presented with television advertising. Radio: Like television, radio presents a unique and large general audience. Therefore, general promotional, seasonal, and other timely messages are best presented through radio advertising. In recent years, digital marketing trends have increased exponentially, and with good reason. Digital marketing has become the most effective, most trackable marketing channel available, with multiple advertising avenues that fit any style message and brand. Digital advertising platforms offer easily measured analytics and deliver immediate actionability with calls to action, promotional information, and service scheduling. However, effective planning and platform proficiency is still key to productive advertising efforts, even on digital platforms. Website SEO: Ideally used as a landing platform for web traffic, your website should thoroughly introduce and explain each service and skill that your roofing company provides. With available analytics that are regularly updated, you can always be sure of your success. Social Media PPC: These marketing platforms work well when communicating a message or offer that includes an immediate call to action such as a “click here” button or “call now” link. They offer incredible ROI and measurement metrics for complete control. Google Pay Per Click: Google PPC roofing advertising is ideal for increasing web traffic and brand awareness. It’s also perfect for increasing website conversions and unique visitor traffic. While PPC campaigns can vary greatly in cost, they are generally less expensive than most other platforms and generate an increased ROI. 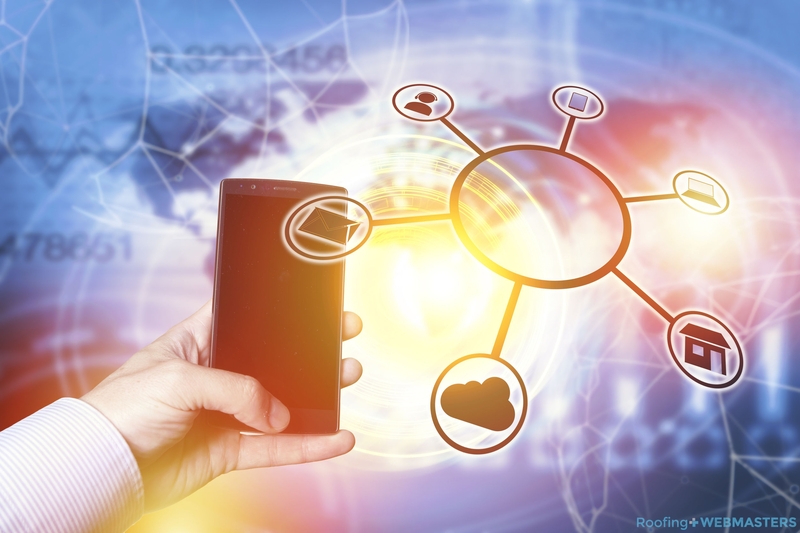 In today’s world, IoT has not only changed the way the public finds information, but it has also changed the way businesses reach their prospective clients effectively. Although traditional roofing advertising tools and platforms are still used and productive, digital marketing has taken over the marketing landscape. Utilize digital marketing in your roofing advertising campaign efforts to increase your success, visibility, and ROI. Within the digital marketing world, you have many choices on how and where to spend your advertising dollars. Each channel offers its own rewards and challenges that should be considered when planning your roofing advertising. For example, digital advertising offers highly customized audience selection which can provide better message reception but can also lend to low visibility. Being aware of the benefits and downfalls of each digital advertising platform can help you choose the best route for your roofing advertising dollars. Search engine optimization, or SEO, is crucial in order to appear in Google and other search engine results. With over 40,000 search queries completed per second, Google is the number one way to find information on services, products, and just about anything else. 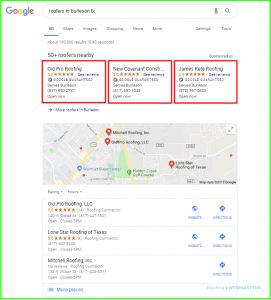 Because the Google search has transformed the way customers locate services, search engine optimization for your roofing service is a top source for reaching prospective customers. Organic Search Optimization Helps Ensure Your Business Appears in Google SERPs. Through the years, Google has updated the way its search delivers results. 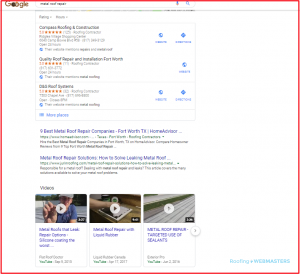 Today, quality content, accurate information, reputable linking, and precise keyword usage are the best ways to ensure proper SEO for your roofing business. Using these strategies along with proper coding and compelling user experience can land your roofing company higher in search rankings, leading to extended reach and maximize conversions. Organic Marketing Offers Free Roofing Leads for Your Business. SEO, or search engine optimization, is a marketing strategy that utilizes Google and other search platforms to present company information and generate roofing leads. When a search query is made on Google, Bing, or another search platform, keywords are identified and search results are presented according to relevance and site quality, among other elements. Optimizing your roofing website to appear higher in these search results can boost your company’s reach and expand your customer base. Use tried and true marketing SEO strategies to begin your efforts and revise your plan as needed. When Completed Properly, Your GMB Account Provides Crucial Details for Your Company. Business Type: The correct business type is imperative in order to index correctly in Google searches. Services Offered: Since this is a top way Google indexes your company, your service list should be comprehensive and include multiple keywords. Location: Providing the exact location of your roofing company boost the chances of appearing in the very important local search. Contact Information: Providing links to your contact information exponentially boosts the chances of goal completion. Company Images: Adding images to your Google My Business account increases the odds of appearing in organic Google searches. Hours: Adding details like hours of operation creates a more complete and more trusted Google profile, leading to better search rankings. Reviews: Reviews provided on Google as well as other platforms boost your site’s authority which can dramatically boost search rankings. Website Address: Offering a link to your site can boost web traffic along with conversion rates. Once your account is verified, your company can begin appearing in Google search results. 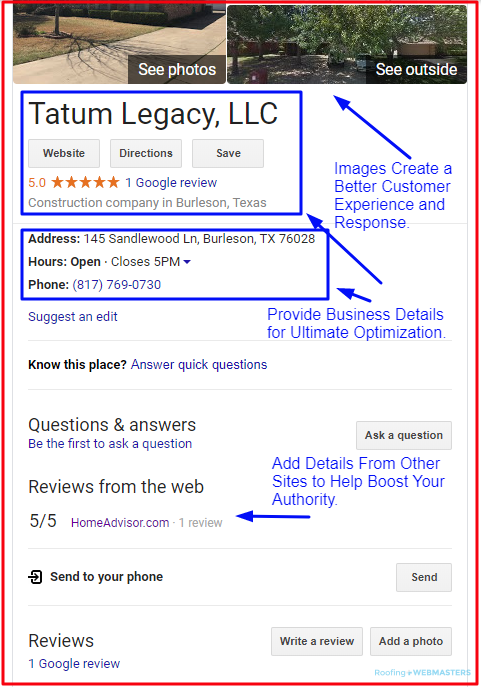 As Tatum Legacy displays, having a well-organized Google My Business account paired with great on-site SEO can land your roofing company at the top of the Google search. Completing Your Google My Business Information Provides a Better Google Homepage for Your Business. Roofing websites are no help to their company if they can’t be found. 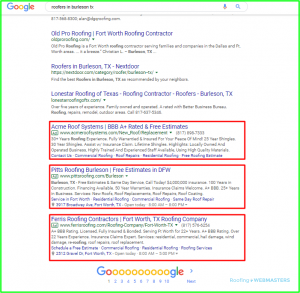 Roofing SEO practices can help Google index your site more efficiently and help you rank higher on SERPs, leading to extended reach and increased roofing leads. In order to optimize correctly for Google, your roofing website needs a few key elements which help the search engine identify what your site is about. Without these key elements, Google and other search engines may have trouble indexing your site or may even misinterpret the information. Each page of your roofing website should have a title tag which tells Google bots the general idea of your roofing webpage. This title also appears as a search result title when a query is performed. Your page’s title tag should include at least one keyword along with a brand or location tag. Along with the title tag, Google displays a short description with each result when a query is made. These descriptions, otherwise known as meta descriptions, provide Google bots with more detailed information about your web page’s content. 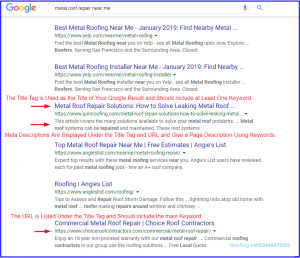 The use of keywords in your roofing meta description is imperative to help Google correctly index the information and increase the chances of appearing in Google searches. The Metadata You Enter on Your Site Appears in Searches to Identify Content Relevance. Each time a Google search is performed, Google bots use website coding to scour the internet searching for relevant material from trustworthy websites. Clean coding is a method of presenting the back end coding of your site to Google in the simplest way possible. With clean coding, your site’s code is clear, well-organized, and effectively labeled so the Google can easily decipher the exact content for better ranking. Cluttered code issues arise in instances where a website is created from a template or when a site is redesigned incorrectly. These practices create long code sentences that are unneeded and can provide incorrect information to search bots. Providing Clean Coding Helps Google Bots Quickly and Accurately Index Your Site’s Information. Combat coding issues with the use of clear functions and well-labeled commands like MKCS Roofing does here. Use schema coding to provide Google bots with clear content subject lists and details and use up-to-date code structure for simplified, clearer communication. Schema codes work as lists to provide Google bots with clear, organized subject matter that can be easily indexed for searches. The use of H2s and H3s along with keyword placement can also aid Google and other search engines in identifying and indexing your information correctly. Pay per click (PPC) advertising combines traditional ad creation with keyword bidding to reach new customers and gain more roofing leads. PPC advertising is offered almost every platform including Google, Facebook, Instagram, YouTube, and more, and can dramatically increase your website traffic and marketing ROI. Roofing PPC ads also offer flexible budgeting, customizable audiences, and ad revision to give you complete control of your campaign at all times. PPC Advertising Offers Superior Audience Reach and Complete Customization. Google Ads, formerly Google Adwords, provides a comprehensive platform for PPC marketing that displays search and display ads according to relevancy, keyword bidding, and ad quality. These ads can appear in Google search results or on Google Maps results along with Gmail, YouTube, and many other Google partners. Where you want your ad to appear will be the deciding factor in the format of your ad which can include images, text, video snippets, and more. While Google search ads have only text and link buttons, display ads with images and video can be displayed on other platforms such as YouTube, Gmail, and many more. Google also offers the text ad with extensions which provides varied content delivery throughout every Google platform. PPC Marketing on Google Ads Provides a Measurable ROI That’s Higher Than Any Other Method, In Most Cases. The two main factors for deciding where your roofing ad appears on Google are keyword bidding and ad relevance. Keywords in Google Ads are arranged according to popularity in searches and are priced accordingly. The more a keyword is used in searches, the more expensive the keyword will be to bid for. Likewise, the more difficult it will be to rank for the keyword. For example, the term “roof repair” is a very popular keyword. Therefore, it will be more expensive to bid on and more difficult to rank for due to all the other roofing company’s trying to rank for the same word. However, “corrugated metal roof repair” is a much more specialized word that will have a lower bid price and less competition. This means that the latter term will be much easier to rank for. 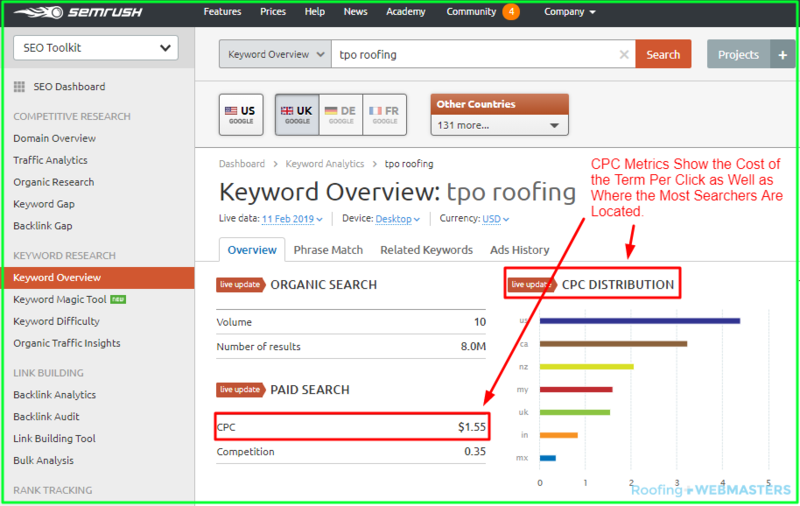 The Roofing CPC Metric Found on SEMrush Delivers Information About the Cost and Search Locations of Your Keyword. When creating your Google ad, it’s crucial to design a compelling piece that’s helpful and has a clear call to action. Your ad should be clear and informative, and link to a landing page with relevant information. It should contain a prominent call to action that encourages the viewer to click the link and offer contact information that the visitor can use to easily contact your roofing company. Use Google Ads analytics tools to measure your ad success and adjust your efforts and budget throughout the campaign for maximum success. Prime Google Ad Space is Located at the Top of the SERP. Google Ads Can Also Appear at the Bottom of the Page. Much like Google Ads, Facebook and Instagram each offer a PPC platform for businesses that is keyword and audience based. 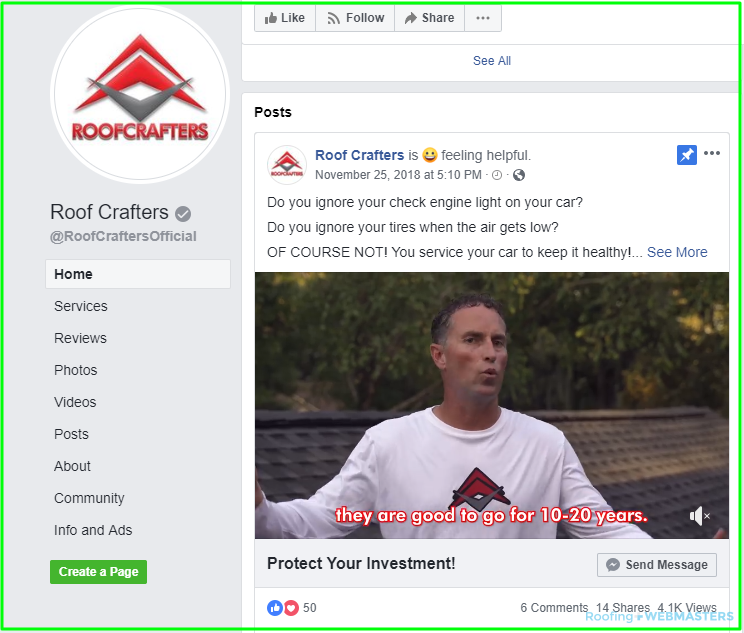 Roofing Facebook ads appear in the news feed as well as in the right side ink bar and can be customized according to audience demographics and psychographics, previous searches, budget constraints, and more to provide the best ROI possible. These ads can be created through the business menu on your Facebook account and can be measured with Facebook analytics tools that are accurate and easy to use. 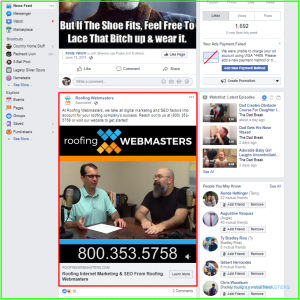 Facebook Roofing Advertising is Most Often Done With In-Feed Ads. Instagram offers an ad platform much like Facebook which can be set up from your Instagram menu once your account is switched to a business account. Like Facebook and Google, your ad audience can be customized by demographics and psychographics, budgetary constraints, and even online viewer behavior. While not as extensive as Facebook or Google, this platform also offers analytics tools such as engagement, follows, and more to measure the success of your Instagram roofing ads campaign. 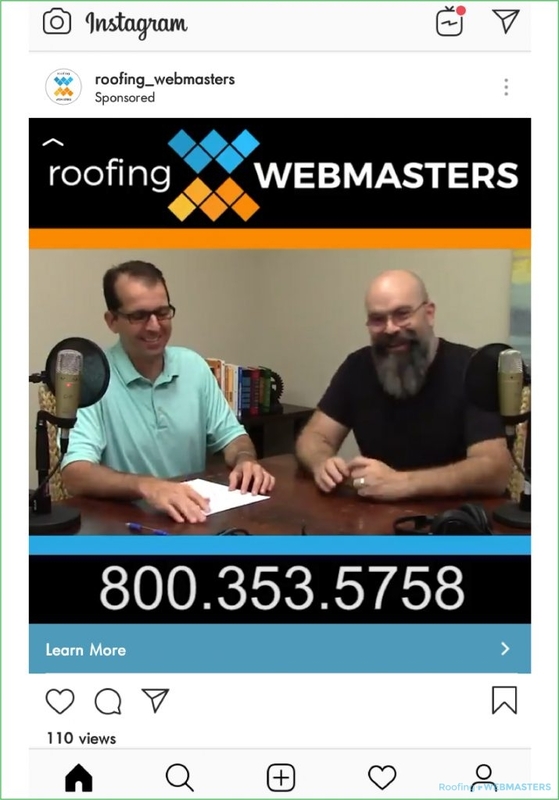 Your Roofing Advertising is Presented Right In Viewers’ Feeds With Instagram. Like with any PPC roofing ad, Facebook and Instagram ads should have a clear message as well as a call to action. While not required, these ads that boast images and videos tend to be much more successful on these platforms. These ads can direct your viewers back to your social page to increase likes, follows, and engagement, or can link to a landing page to maximize website traffic and conversion rates. Along with Facebook and Instagram, there are PPC marketing opportunities for your roofing company on just about every social platform. YouTube, Twitter, and Snapchat each offer PPC advertising plans that operate mainly off of keyword bidding and audience selection and can help expand your reach even further. Like with main PPC platforms, these ad hosts provide customized budgeting, sometimes without a minimum dollar amount, and offer analytics tools that can help you hone your campaign for maximum results. 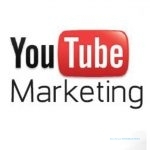 YouTube offers a unique PPC platform that displays your ad at the beginning of other videos as well as in the right link bar. This unique ad display format allows your videos to be viewed with a clickable link that encourages conversion. Other social media platforms like Snapchat and Twitter also provide PPC marketing plans and tools that can be utilized to build backlinks, aggregate new web traffic, and build followers and engagement on the social site itself. 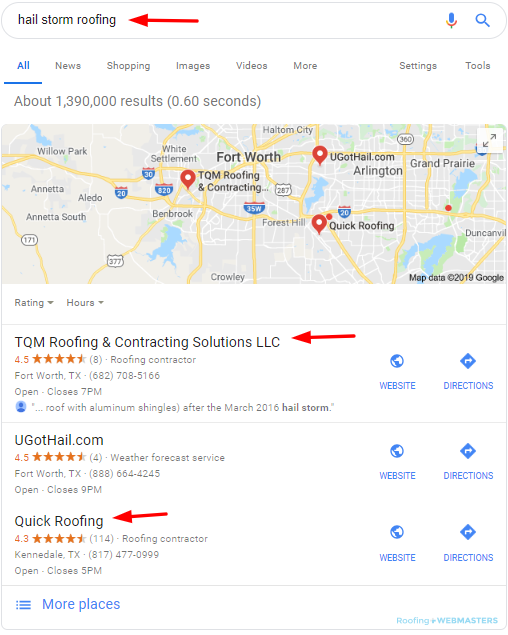 While PPC campaigns have proven to have a remarkably high success rate, don’t discount the value of organic roofing advertising on these platforms. After all, these platforms were created for making a connection, so why not take advantage? With over 2 Billion users, social media platforms can help maximize your reach and web traffic. However, using each platform appropriately and productively takes planning and organization. Using Video and Images in Your Posts Helps Boost Post Engagement and Response. Post Regularly: Social media posts typically have a shelf life of one hour to one day. Post regularly to keep your brand center stage. Use Rich Media: While not required, social posts with images or video are twice as likely to be seen and engaged with. Use Keywords: Just like in searches, keywords matter in social posts, and can help boost visibility and reactions. Include Links: Along with your post, include calls to action and links back to your roofing site for ultimate results. Along with your company’s social media account, you are provided with an array of analytics tools that can help you identify the best advertising avenues for your business. These metrics provide information on engagement levels, sharing, new followers, and more to give you a comprehensive overview of your social media roofing advertising efforts. Use these metrics to hone your campaign and posts and create content that your prospective clients react to. Using the Provided Analytics Tools Helps You Get a Clear Picture of the Results of Your Efforts. Remarketing is a digital marketing technique that uses tracking codes to collect visitor information and re-present relevant marketing material. When your site is equipped with remarketing codes, a visitor who views your wood shake roof repair webpage may see a later advertisement for free roof inspections. This form of roofing marketing boosts response and conversion rates by presenting information to viewers who have already seen your content. On the Google platform, remarketing efforts are set up as campaigns and established through metrics delivered by the platform. Your remarketing campaign can be created to be reflective of viewers searching past keywords, past viewed content, or even website behavior to hone in on the precise audience you’re looking for. These ads can be scheduled to appear at different stages of the conversion process to offer special deals that encourage goal completion, or they can present information on products and services that your viewer has previously looked at. By using Google remarketing, your ads are nearly 70 percent more likely to be viewed. Like Google, Facebook offers remarketing efforts for your PPC campaigns. This platform uses a code snippet that is embedded into each page of your site and tracks customer behavior. Then your ads are remarketing to these viewers while they are visiting Facebook, either on their news feed or on the link graph located to the right of the news feed. Remarketing to these customers re-presents information that they were previously interested in. These ads may possess more details, a special offer, or another call to action that encourages the viewer to complete your goal. These efforts are easily tracked by the analytics and metrics provided by the platform. Whether you’re working on your roofing SEO or creating a PPC marketing ad, keyword research is crucial to your project. Keywords are the main terms that the general public uses when performing searches on Google and other search engine sites. Bot crawlers use these terms to index websites and ads according to content and search relevance. Without proper keyword usage, your site and ads will not appear in searches. Luckily, there are many reputable programs and platforms to help you identify the best roofing keywords to use on your roofing site and in your PPC ads. Programs such as MOZ and SEMrush provide important keyword metrics such as volume, cost per click, and competition, which can help you identify the most beneficial term group for your roofing advertising. Proper Keyword Research Helps Increase Your Chances of Appearance. 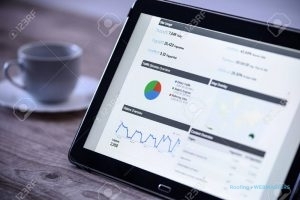 These metrics and reports give valuable, up-to-date information for each of your keywords that can tell you how likely the term is to appear in organic and paid SERPs, how steep the competition is for the word, and how likely the term is to be successful when used on your roofing website or in roofing advertising efforts. When you’re competing for roofing leads in your community, every effort is important. While digital advertising is today’s best way to reach potential customers, the technicalities and efforts require skill and know-how to outrank your competition. When you want flawless roofing advertising that gets your company results without busting your budget, turn to the Roofing Webmasters roofing marketing pros first. Our team has the experience and knowledge to develop a roofing advertising plan for your business that expands your reach and gets you noticed for better ROI and more roofing leads for your team. We work with you to provide a customized marketing plan that fits your target market and encourages action so you always get your money’s worth. For roofing advertising that you can count on to get results, call the Roofing Webmasters experts today at (800) 353-5758 to schedule your appointment. Summary: Nolen & John, co-owners of Roofing Webmasters discuss common sales spiels and jargon issued by marketing companies and warn local roofers about the lack of results that can coincide with far-fetched promises.